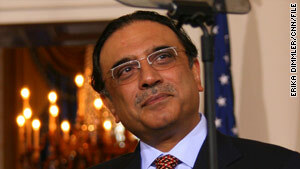 U.S. security officials are asking Pakistani President Asif Ali Zardari to step up anti-terrorism efforts. Islamabad, Pakistan (CNN) -- Top U.S. security officials met their Pakistani counterparts Wednesday to discuss the attempted Times Square bombing and the prevention of future terrorist attacks. CIA Director Leon Panetta and National Security Adviser James Jones met with Pakistani President Asif Ali Zardari and other key Pakistani security chiefs, said a joint U.S.-Pakistani statement. They were expected to ask Pakistan to ratchet up the fight against militants in the country's North Waziristan region. Washington wants an aggressive push by Pakistani authorities to take action against al Qaeda-linked groups in the largely ungoverned tribal areas along its border with Afghanistan. It was the first such meeting since the May 1 botched bombing attempt in Times Square. Suspect Faisal Shahzad, a Pakistani immigrant, is thought to have received training by the Pakistan Taliban in Waziristan region. Shahzad, who faces five counts in connection with the attempted bombing, appeared in a Manhattan court Tuesday. He also considered attacks on Rockefeller Center, Grand Central Terminal, the World Financial Center and Connecticut helicopter manufacturer Sikorsky, going so far as to case some of the additional targets, a senior counterterrorism official with oversight of the investigation said Tuesday. The U.S. government wants to see continued Pakistani cooperation in determining what role the Pakistani Taliban may have played in assisting Shahzad. Zardari said Wednesday that militancy and terrorism are the common enemy for the United States and Pakistan and that "robust cooperation" should continue, according to the joint statement. He said Pakistan desires a long-term, multifaceted and durable relationship with the United States that no incident should be able to diminish.